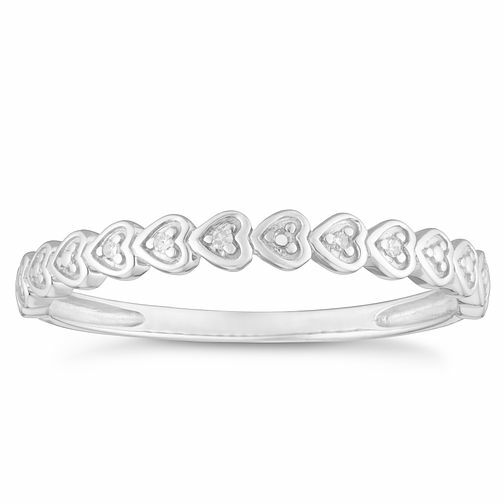 Show your endless and undying love for your one and only with this diamond-set heart design eternity ring. Set with round cut diamonds, this 9 carat white gold eternity ring has the right amount of sparkle to elegantly celebrate any lasting relationship. 9ct White Gold Diamond Heart Eternity Ring is rated 5.0 out of 5 by 2. Rated 5 out of 5 by Anonymous from Beautiful ring Lovely style ring with small diamonds and heart detail. Is a minimalist ring which is perfect for me as I don't wear large jewellery. Rated 5 out of 5 by Anonymous from Beautiful ring My husband bought me this ring for my 40th birthday. I absolutely love it! The detail on the ring is lovely and goes so well with my wedding rings.